There’s nothing more delicate than a newborn baby’s skin. And like the food that we put into their bodies, taking care over what we put onto their skin is just as important. 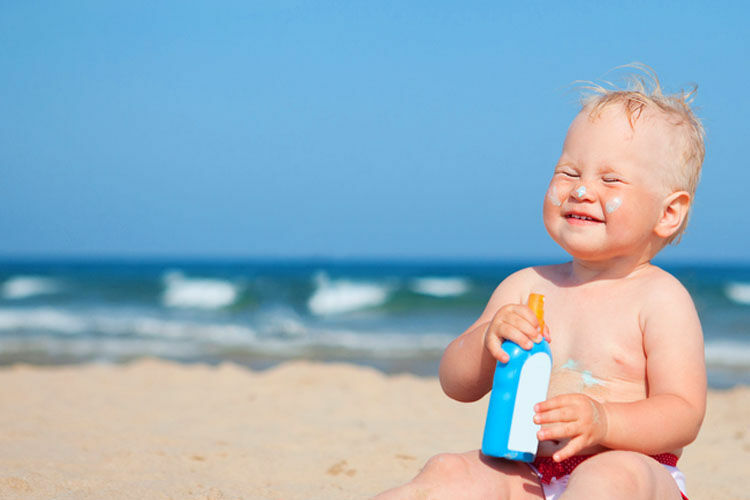 The best way to protect them is to use organic or natural baby products, free from harmful chemicals, toxins and nasties. We asked the Mum’s Grapevine Facebook Baby group members to recommend the natural baby products they use and these are the natural skincare brands they recommend. Ecostore (from $12.95): Adding to their successful range of eco-friendly home and body products, Ecostore gets a big thumbs up for their products for baby. They’ve got everything from soap to shampoo covered, plus an award-winning sleepytime bath to help ease into the nighttime routine. 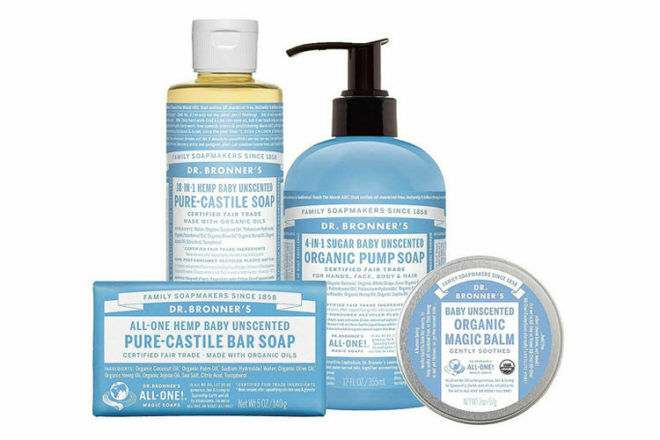 Dr Bronner’s (from $7.95): Known worldwide for their 18-in-1 Magic Soaps the Dr Bronners range has extended into baby skincare with Fair Trade baby products that are all fragrance-free – ideal for baby’s sensitive skin. 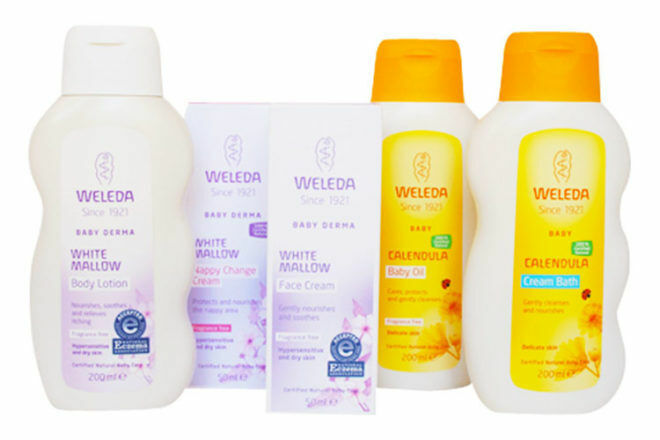 Weleda (from $15.95): Certified Natural and Organic, the baby range from Weleda gives daily care and protection to our little people. Calendula soothes and softens while white mallow helps maintain the skin’s moisture – A great buy for babies with eczema. 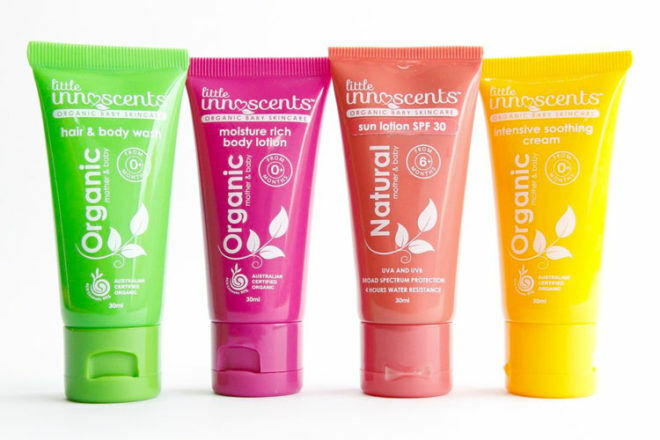 Little Innoscents (from $10.95): Suitable to use from birth, the range from Little Innoscents is as gentle on baby’s skin as it is on the planet. Using only ingredients sourced in nature, the award-winning organic baby products have tots covered day and night. Wotnot (from $14.99): Approved for use on skin prone to eczema, rosacea and psoriasis, the baby products from Wotnot nourish bubba’s skin with the help of omega-3 rich ingredients like flaxseed oil, plus soothing properties of Certified Organic aloe vera and chamomile. 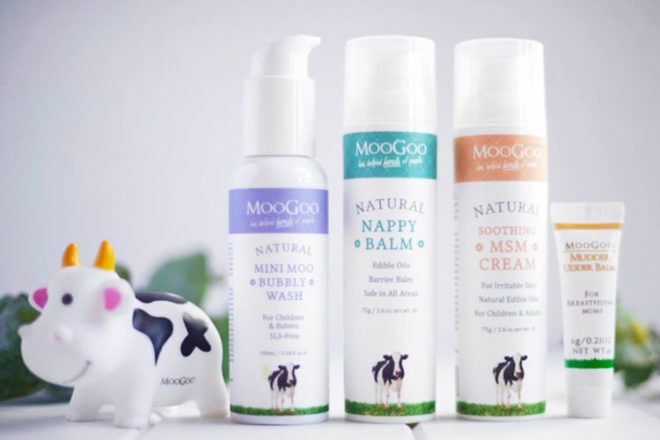 MooGoo (from $13.50): Loved by breastfeeding mums all over Australia for their Mudder Udder Balm, MooGoo is helping herds of families with their mild range for baby too. Made from natural and edible ingredients the Nappy Balm, Mini Moo Bubbly Wash and MSM Cream are full of soothing properties for baby’s new and delicate skin. 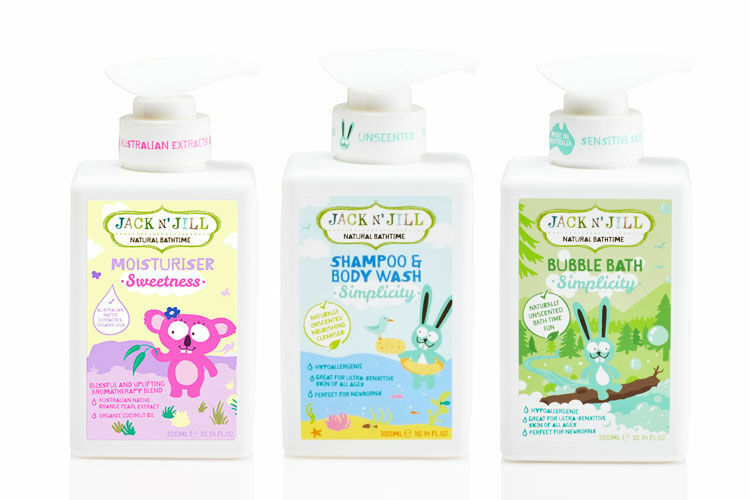 Jack N’ Jill (from $12.95): It’s the natural skincare brand with the gnarly characters. Infused with native ingredients such as White Cypress and Orange Pearl extracts, the smell is as good as the feel. The bottles are 100% recyclable too! Nature’s Child (from $14.95): Eco-friendly families love the Certified Organic range from Nature’s Child. Featuring a body wash, massage oil, baby powder, bottom balm and multi-purpose wonder balm – it’s your one-stop-shop for organic skincare. 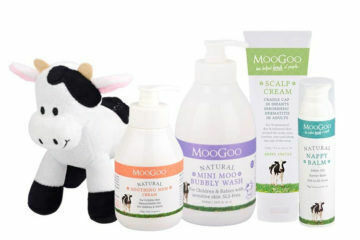 Milk & Co (from $6.95): Back with a brand new look, Milk & Co (and Millie the cow, of course!) 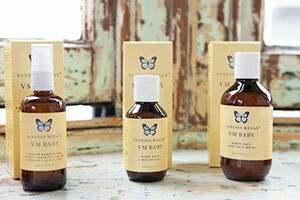 bring us an adorable range of baby products packed with organic and natural ingredients. They’ve covered the everyday essentials like moisturiser and bath wash and gone one step further with their calming room spray made from lavender and grapefruit oil – divine. 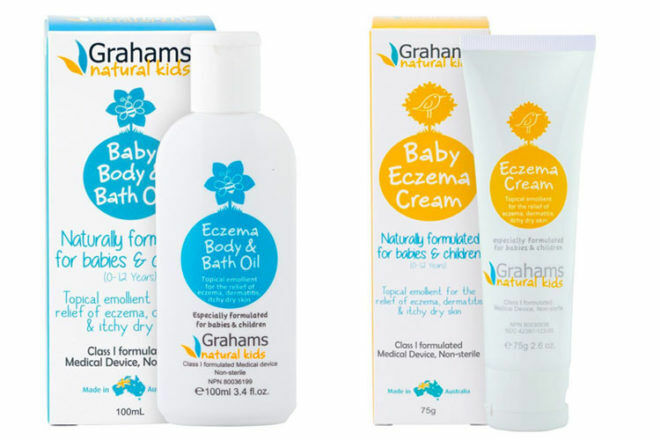 Grahams Natural Kids (from $13.95): Gentle enough for newborns, the Natural Kids range from Grahams is full of the good stuff – think Shea Butter, Almond Oil, Zinc and Vitamin E. The powerful combination helps keep skin soft and supple while reducing irritation and inflammation. Frankly Eco (from $24): New kid on the baby skincare block, Frankly Eco is incredibly kind to bubbas skin. With ingredients such as Honeysuckle Extract and Lemon Peel Oil you’re guaranteed to finish bathtime feeling just as good as baby. Lullaby Skincare (from $28): Created with baby’s sensitive skin in mind, the beautiful collection from Lullaby Skincare use over 80% organic Aloe Vera as a base ingredient to help soothe and nurture baby’s skin. The range includes a nappy cream, calming body wash, soft body lotion and SPF 30 sunscreen. 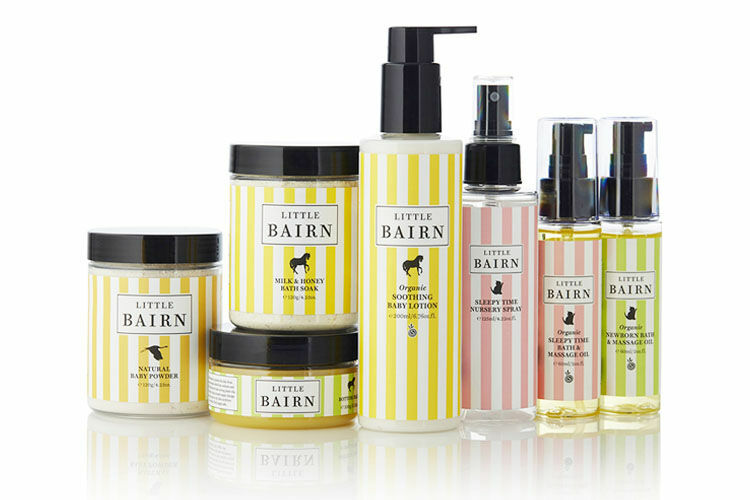 Little Bairn (from $19): A touch of luxury for the little one in your life, Little Bairns baby products are 100% organic, Australian made and oh so indulgent. Created for mums and bubs alike, the award-winning baby range is about making bath time fun (and fabulous) for all. 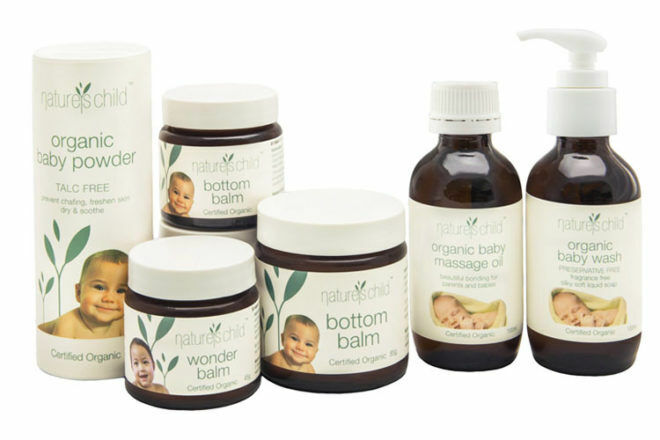 Bubba Organics (from $23.95): Lovingly made in Melbourne the 100% natural range from Bubba Organics features a baby bath wash, bottom cream and moisture lotion, plus many more. There’s no hidden nasties and no added water to weaken the pure ingredients used. The cute-as-a-button bottles are recyclable too! Gaia Natural Baby (from $7.95): Their award-winning Sleepytime Bath and Soothing Cream are just two of our faves from the extensive Gaia Natural Baby range. With skin-softening ingredients such as Organic Avocado Oil, Organic Calendula and Organic Rosehip Oil, they’re the perfect accompaniment to your babes evening bath. Vanessa Megan Mum & Baby (from $39.99): We’ve loved their mum and baby range for years. Using only the very best natural and organic quality ingredients, there are no hidden chemicals, parabens or fragrances to irritate baby’s skin. Lovekins (from $24): Australian made and owned, Lovekins is a natural baby skincare range enriched with Australian superfoods to pamper and protect baby’s skin. With ingredients ranging from Kakadu Plum and Quandong to Lemon Myrtle and Ylang Ylang, no-nasties range smells and feels amazing. 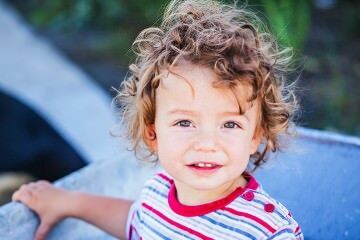 Searching for the best natural baby skincare and still not sure if any of these are right for you? Continue your search online by jumping into one of our closed Pregnancy or Baby groups and ask thousands of other Australian mums what they recommend – ‘What to buy’ is the most talked about topic, followed by MIL vents!